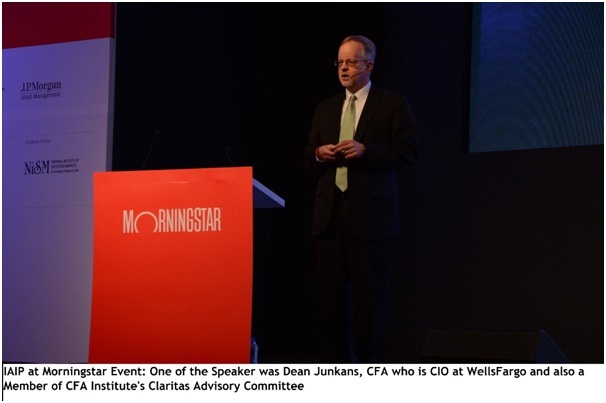 Indian Association of Investment Professionals (IAIP) was pleased to associate as a ‘Knowledge Partner’ with the fourth edition of the Morningstar Investment Conference, which was on November 11-12, 2014 at the Grand Hyatt, Mumbai. IAIP initiated discussions with Morningstar in Aug 2014 and the first meeting was conducted on Sept 02, 2014 with Anil Ghelani, CFA and Amit Khurana, CFA. The partnership was confirmed on Sept 12, 2014 and IAIP was recognized as “Knowledge Partner” @ MIC 2014. IAIP Members were eligible for the discounted fees of INR 6500 against regular fees of INR 8000. IAIP members were eligible to earn CE Credits for attending this Conference. 5.5 hours for Day 1 and 4.0 hours for Day 2 were awarded based on the attendance. This entry was posted in Events, Mumbai and tagged Amit Khurana, Anil Ghelani, CFA, IAIP, Morningstar, Morningstar Investment Conference. Bookmark the permalink.